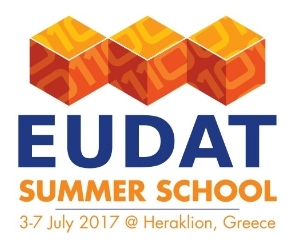 From 3-7 July 2017, EUDAT is organizing a Summer School, set in the stunning landscapes of Heraklion, Crete, and kindly hosted by FORTH, to introduce early-career researchers to the principles and tools needed for careers in data intensive science and data management. BioSharing Registry: connecting data policies, standards & databases in life sciences WG is coming to the end of its 18 month life cycle at the 9th Plenary Meeting in Barcelona. 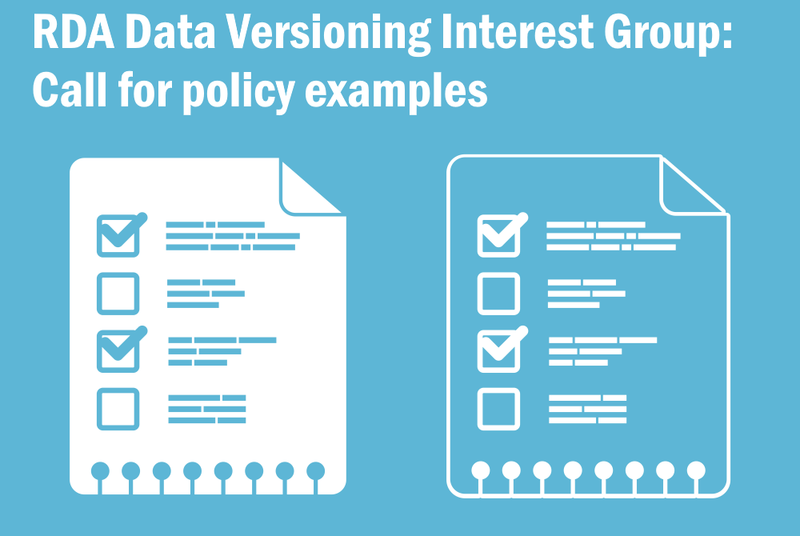 In preparation for the group session at RDA Plenary 9 in Barcelona, the group would like to invite the RDA community to provide examples of data versioning policies and procedures in operation at their institutions. 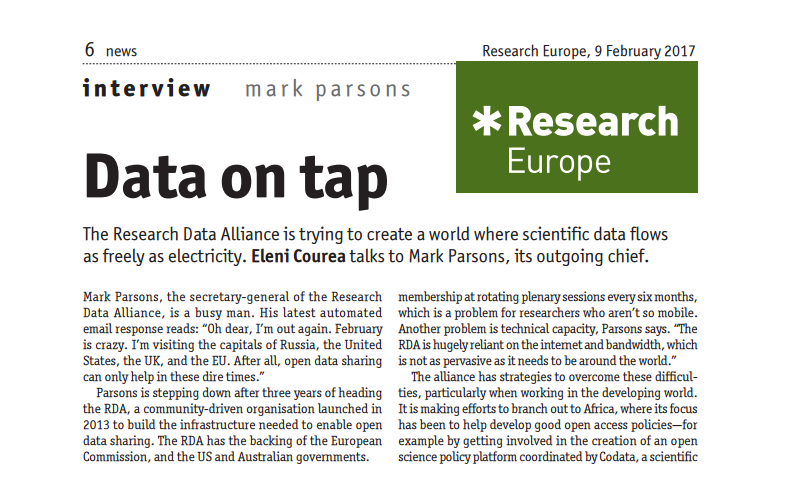 The Research Data Alliance is trying to create a world where scientific data flows as freely as electricity. Eleni Courea talks to Mark Parsons, its outgoing chief. 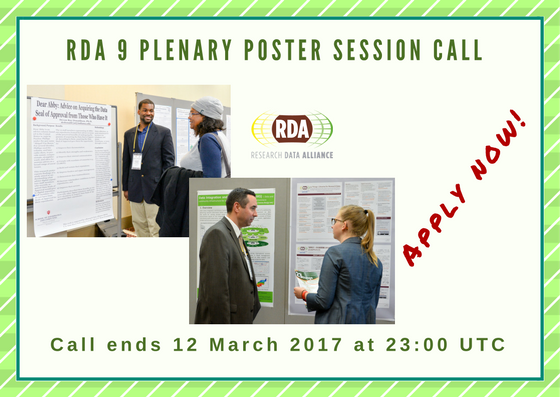 The Research Data Alliance (RDA) is recruiting a Secretary General to begin in April of 2017. 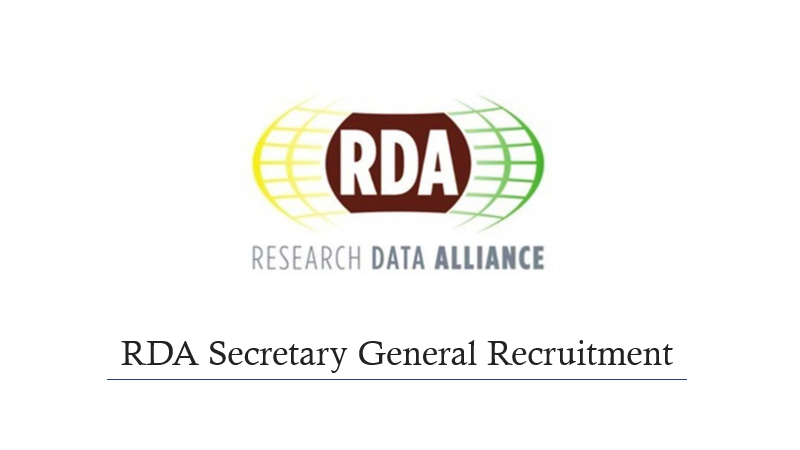 The ideal candidate is a suitably experienced leader with a demonstrated ability to engage with the members, Council and senior stakeholders of the RDA, and the ability to be a key driver of the RDA mission of rapidly building the social and technical bridges that enable sharing of data. CODATA, RDA, and WDS plan to hold a Second International Data Week (IDW2) in September or October 2018. We are requesting expressions of interest to host the 2nd edition of this exciting event. 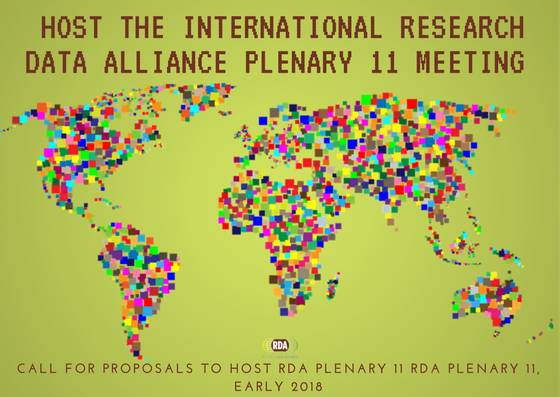 The Research Data Alliance (RDA) Council is seeking proposals from organisations or countries interested in hosting the 11th RDA Plenary meeting in early 2018 (from late February to early April). 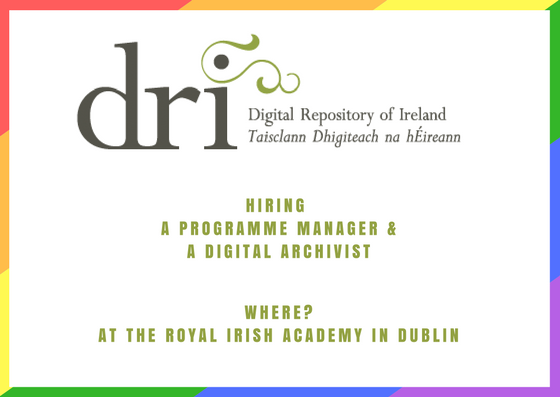 The Digital Repository of Ireland are hiring a Programme Manager and a Digital Archivist, each on 3-year fulltime contracts. The posts will be based in the Royal Irish Academy in Dublin. The RDA Working Group on Data Citation (WG-DC) brings together a group of experts to discuss the issues, requirements, advantages and shortcomings of existing approaches for efficiently citing subsets of data.